Eric Pickles MP returns to Crewe and Nantwich for the first time since May's historic by-election victory. During the Crewe and Nantwich by election I had always assumed that a know it all central Labour Party has imposed vicious crass class hatred campaign on a reluctant local Party. I was wrong, and would like to make this public apology; no the Labour Whips and the Party apparatchiks found Crewe Labour’s inner soul. 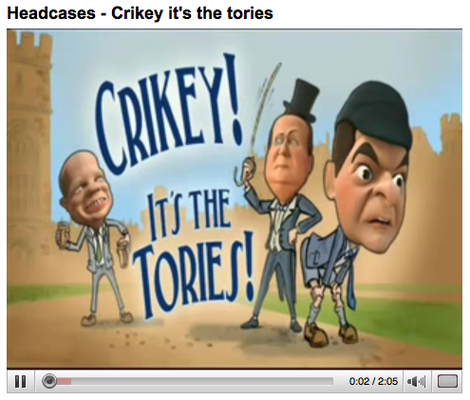 Labour has picked a new candidate to replace the defeated Dunwoody, in his first press release to get any coverage he attacks the Conservative MP and local hero Edward Timpson, for being lazy and continuing to work as a barrister – not true of course – but when did the actuality ever get in the way of a Labour smear campaign. 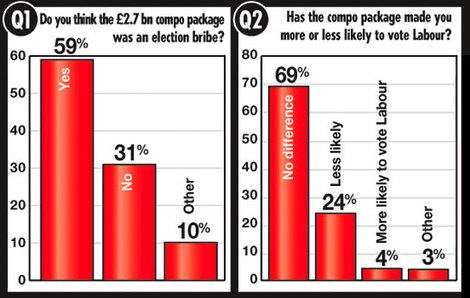 Judging from the local reaction to the smear be must be regretting the ill judged release. The local paper’s letters columns are full of people defending Edwards’s hard work and from the moment you arrive in the town you have no doubt who is the MP and that he is working for everyone. In the centre of town a shop window next to a white portcullis stands the name Edward Timpson MP in bold letters. Ex canvassers will remember this as the central campaign office which Edward has taken over has his main constituency office. The last time I had seen it the room had been packed with blue balloons. I am back for the first time since the exciting days of early summer to officially open the office. People who travelled from across the country in May should feel proud; Edward has more than fulfilled his election pledges: weekly surgeries spread around the constituency, a report-back newspaper, regular column in the local press and a willingness to help anyone is the hallmark of this new Conservative MP. He is fighting hard against two local closures the sorting office and the tax office. Last week he was thrown out of the tax offices for daring to enquire after his constituent’s jobs. Undaunted he continued the meeting in the park outside. Waiting for my train back to London I bumped into someone I met during the campaign he said, “You probably don’t remember me but we met in Crewe Market when you introduced me to Mr Timpson. I had my doubts about voting Tory, but you said I should give him a chance, well I did, I voted Tory for the first time ever. I have no regrets and I will be voting for him to finally get rid of Brown when the time comes.” I suspect that he is not alone and that Edward will be MP for Crewe and Nantwich for many decades to come. 2.45pm Good news update: "I have just been contacted by the Labour candidate for Crewe and Nantwich who assures me he never said that Edward Timpson was "lazy" and that he "never would". I'm happy to clarify this comment, and delighted that Edward's hard work for the people of Crewe and Nantwich is even recognised by the opposition. Well done Edward, and keep it up." A shadow cabinet minister told ConservativeHome yesterday that the by-election campaign in Crewe was the best organised that he'd ever seen. He said there is no waiting around - like in so many previous campaigns he has attended but there's an almost immediate tasking once you arrive at the Tory campaign HQ, just ten minutes from Crewe railway station. The Conservatives have already distributed two leaflets. We republished one yesterday. And now we're seeing this bar chart distributed throughout the seat - based on these numbers from last Thursday's local election results. IT'S CLEAR THAT THIS SEAT CAN BE WON. 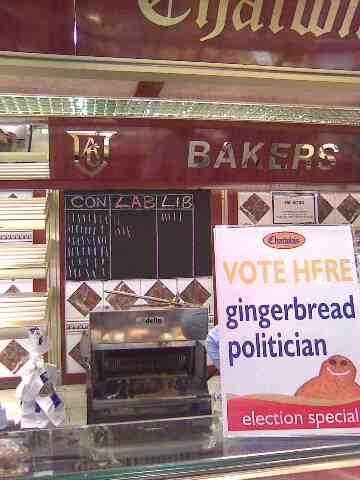 LET'S PUT SOME ICING ON LAST THURSDAY'S CAKE AND MAKE EDWARD TIMPSON THE NEXT MP FOR CREWE AND NANTWICH. If you can get to Crewe and Nantwich to help between now and the 22nd May please call 07594 567273 or email [email protected]. And if you - particularly our male readers - need another reason for going to Crewe then you should know that Miss Great Britain is also standing as a candidate. You might bump into her and woo her for the cause! "Mrs Pickles was promised a lavish holiday after the local elections campaign, and I'm delighted to report that she's loving Crewe and Nantwich." BB reports that the Conservatives are already on their third leaflet drop. We had only heard of two leaflet drops in three days but it may be that Ben is better informed. Whatever: It's an impressive start to a campaign being coordinated by Mr Eric Pickles and Stephen Gilbert. And so, to repeat, and not for the last time: If you can get to Crewe and Nantwich to help between now and the 22nd May please call 07594 567273 or email [email protected]. “I’d like to congratulate Tamsin Dunwoody on becoming the Labour Party candidate in Crewe and Nantwich. 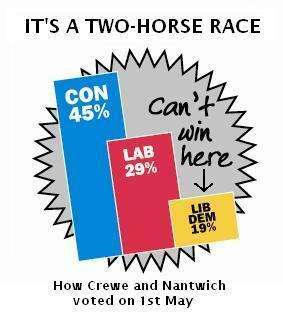 And I look forward to a campaign in which we can really debate the issues that matter to people in Crewe and Nantwich. As a local man, who has lived and worked in the area all my life, I understand the worries and concerns of local people. “At a time when families are struggling with rising food, petrol and utility bills, they need help with the cost of living. But Gordon Brown hit them when he got rid of the 10p tax band. When violent crime in the local area has trebled, we need the police on the beat, not behind desks. When local services are threatened with closure, we need an MP who campaigns to keep them open. And we need more support for local services, with the NHS, local housing and schools under pressure because of increases in the population. 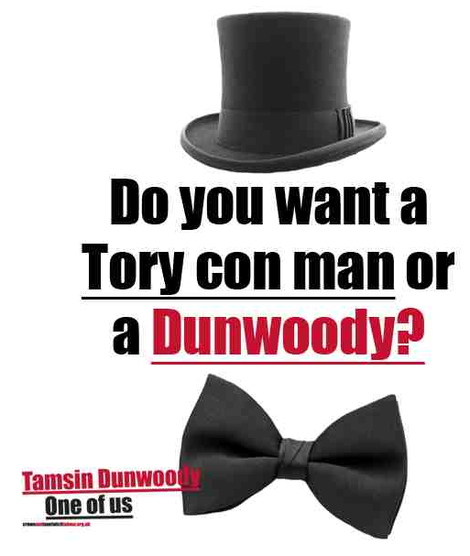 * Headline of Tory press release: "Edward Timpson: Tamsin Dunwoody is an outsider who won’t stand up to Gordon Brown" Download PDF of Edward Timpson's letter to Tamsin Dunwoody. Related link: Thursday night's local election results were encouraging for Tory prospects in this by-election. BUT NOTHING CAN BE TAKEN FOR GRANTED BUT WHAT IS CLEAR IS THAT THIS IS A TWO HORSE RACE BETWEEN LABOUR AND THE CONSERVATIVES. George Osborne is coming to the constituency tomorrow afternoon. Please do get in touch for more details. Should selected Tory candidates be subject to compulsory re-adoption in the event of a by-election? Both Iain Dale (indecent haste to call a by-election) and Guido (Labour using a condolence book for Gwyneth Dunwoody to harvest email addresses) have both been examining Gordon Brown's effort to keep hold of the seat of Crewe and Nantwich when the by-election is fought on 22nd May. Also on the case is UK Polling Report's Anthony Wells. Anthony writes that the Tories should be able to win the seat if current opinion polls are accurate. Within his UKPR piece he notes that the LibDem candidate has had to resign. This, apparently, is their normal practice for by-elections. The theory is that a person deemed right to fight a seat the party is unlikely to win in a General Election might be a different person from who the party would want to represent it when the seat is being fought as a by-election with all of the associated national publicity. What do you think of the Conservatives adopting the same rule? 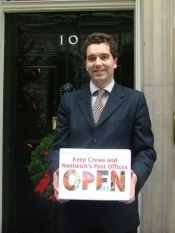 By all accounts our already selected candidate - Edward Timpson - is performing well (including, as the photo suggests, campaigning on the hot issue of post office closures). He lives in the area, although just outside of the constituency, and has been campaigning effectively since being selected. But is there a case in future (not for this contest) for local party members to be invited to reconsider their decision in the event of a by-election. We emphasise the need for "local party members" to keep the final say. What do readers think? 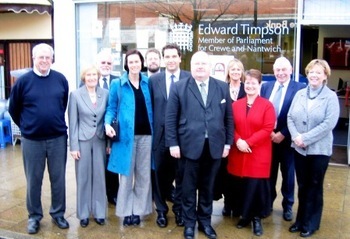 Edward Timpson (of the shoe family) has just been adopted for Crewe and Nantwich this afternoon. He will have the job of overturning a projected Labour majority of 7,494. "Edward is an excellant choice, we have got to know him well as a member of our team, what is our loss is most certainly Crewe and Nantwich's gain. We wish him well and come the General Election I am sure Edward will be heading to Westminster."